During a recent visit to the Church of Saint Senanus in Foynes, Co Limerick, a large photograph on one of the church wall led me to search for the large window in nearby Robertstown Church depicting the life and legends of Saint Senan. 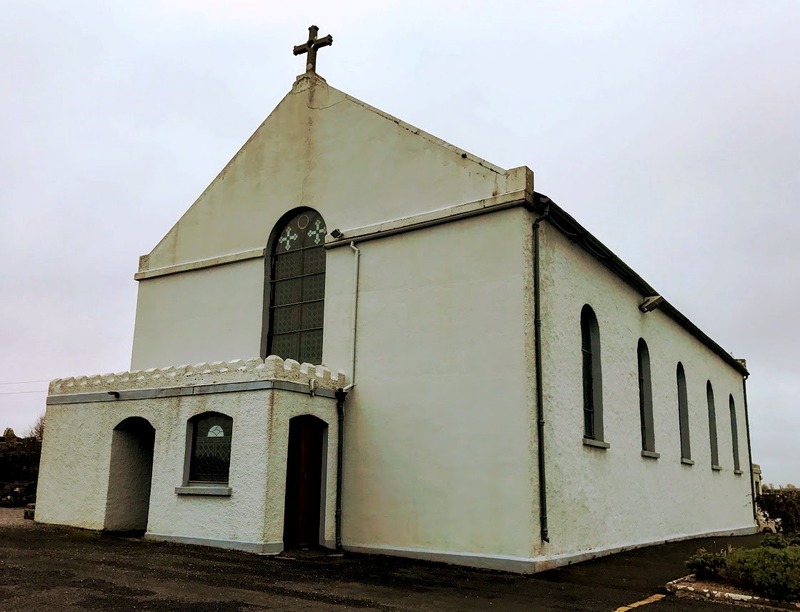 The three churches in at Foynes, Shanagolden and Robertstown are all part of one parish in the Roman Catholic church, and each church is dedicated to Saint Senan or Saint Senanus, who is revered as one of the early Irish saints in the Church who built on the foundations that had been laid by Saint Patrick in the fifth century. The church in Robertstown is just a short distant east outside Foynes, on the main Limerick-Foynes road, and was built in 1830. But the impressive stained glass window is a modern addition to the church. The central figure in this window is Saint Senan with his episcopal staff or crozier, holding a church building in his arms, indicating that he was the founder of a church. In one hand he also holds the bell of Saint Senan, a shrine that is now in the National Museum of Ireland in Dublin. Behind and above the saint are the ruins of his monastery he founded on Iniscattery or Scattery Island. In the top right, Saint Patrick is seen predicting the birth of Saint Senan. Next ,we see God’s call of Saint Senan, and Saint Senan parting the waters of a flash flood, having transformed his staff into a cross. Below this, Saint Cassidus instructs the young Senan. Then we see an angel protecting Saint Senan and his monks as they make their way to Scattery Island. In the top left, Saint David of Wales presents Saint Senan with his crozier or episcopal staff. Below him, the Archangel Michael is seen guarding Saint Senan as he vanquishes the Cathach, the monster on Scattery Island. Next, we see Saint Senan meeting the Pope in Rome. The panel below this illustrates the long tradition that sailors passing up and down the River Shannon would call at Scattery Island to collect pebbles, perpetuating the belief that a pebble from Saint Senan’s monastic island is a talisman against shipwreck. Saint Munchin, founder of the Church in Limerick and patron of the diocese. He died in the year 652 and his feastday is marked on 2 January. Saint Ita of Kileedy is also a patron of the Diocese of Limerick. Her feastday is celebrated on 15 January, the day she died in 550. Saint Lelia who, according to tradition, was the sister of Saint Munchin. She had a church at Killeely in Saint Munchin’s Parish in Limerick. Saint Lelia’s feastday falls on 11 August. Saint Nessan the Deacon who founded the great monastery of Mungret, which equalled Conmacnoise in its day. His feastday is 25 July, the day he died in 551. But who was Saint Senan? The early lives of Saint Senan were written as late as the tenth to the 13th centuries. These lives say that during his travels through Ireland, Saint Patrick was asked about the future of the church in Ireland. He replied that a child named Sanus would succeed him as bishop and that he would convert the whole island. Local lore says that Saint Senan or Saint Senanus was born in 488 AD in Moylougha, four miles north-east of Kilrush, Co Clare. His name may be related to the name of the river god associated with the Shannon. At the age of 14, Senan refused to fight for his tribe the Corca Baiscinn in a local feud against the Corkamoroe people. He hid in a farmyard and fell fast asleep. The farmyard was set ablaze and Senan was found by the Corkamoroe. However, he was set free, as they believed that God was with him. Senan worked on the family farm as a young man and was driving cattle home one evening for his father when his way was blocked by the tide. Senan looked for food and lodgings from a man called Mieger but he was refused. Senan began to pray to God for help and the water receded long enough for him to get the cattle across the peninsula at Traught-Fannon. That night Mieger's home was destroyed by fire and all the menfolk were killed. Senan entered the religious life under the guidance of Saint Cassidus at Irrus before studying at Kilmanagh in Ossory under Saint Natalis. While he was there, Saint Senan performed a miracle by restoring life to an only son on the pleadings of a grief-stricken mother. When Senan’s popularity began to grow, he decided to leave the monastery. For some years, he wandered the country and he began his missionary career by founding a church near Enniscorthy, Co Wexford, in 510 (or 512), giving his name to Templeshannon (Teampul Senain) on the east bank of the River Slaney in Enniscorthy. He finally settled in at Ferns, Co Wexford, under Malachy. When Malachy died, Senan became the abbot of the monastery. On the way home from a pilgrimage in Rome, Senan became a bishop and received his episcopal staff or crozier from Saint David of Wales. On returning to Ireland, he founded a monastery at Inniscarra in Cork. Saint Senan was looking for ‘his place of Resurrection,’ and finally found it at Scattery Island when an angel showed him the island from a hill overlooking the Shannon. Before Saint Senan’s arrival, a sea monster called the Cathach guarded the island. The monster rushed to devour Senan but he blessed the creature and asked him to depart in the name of Jesus. The angel promised Saint Senan that none of his monks would drown crossing the sea, and from this story has grown a legend that pebbles from the island would protect sailors against shipwreck. Many people came to Scattery Island seeking a monastic life, including Saint Ciaran of Clonmacnoise and Saint Brendan from Kerry. On many occasions, the crowds were so great that Saint Senan was close to leaving the area, but he always stayed on the island. His private retreat was at Bishop’s Island, which is a sea-stack on the west coast of Co Clare. Saint Senan lived in a beehive hut on the island, which was surrounded on all sides by sheer cliffs. It is said that Saint Senan died in 544 AD and is buried on Scattery Island in a place called ‘Saint Senan’s Bed.’ Saint Senan’s feastday is celebrated on 8 March. As a bishop, Saint Senan was associated with the Diocese of Iniscattery. At an early period, the abbot-bishop of the monastery on Scattery Island was considered to exercise authority over what later became the dioceses of Killaloe, Limerick and Ardfert. After the Synod of Ráth Breasail in 1111 a canonical diocese of Inis Cathaig was established. This was absorbed by the Diocese of Killaloe in 1189, but was restored by Pope Innocent VI and continued as a separate see under Bishop Thomas (1358-1368). In 1378, its possessions were divided, and the island remained a portion of the Diocese of Killaloe. Later it was subsumed into the parish of Kilrush. However, there is mention of an Englishman, John Grene, as Bishop of Inis Cathaig in 1467, and today the title Inis Cathaig (Insulae Cathensis) is used as the titular see in the Roman Catholic Church. The present titular bishop is Josef Graf, Auxiliary Bishop of Regensburg in Germany. Inside the church in Robertstown, there is also an ornate reredos behind the altar. The High Altar was erected in 1912 by Mary MacNamara O’Brien in memory of her husband Laurence C O’Brien. Today is the Feast of the Annunciation. Coming so close to Easter, yet nine months before Christmas, this feast day provides a natural link between Christmas and Easter, between the Incarnation and the Resurrection. The readings in the Revised Common Lectionary for today are: Isaiah 7: 10–14; Psalm 40: 5-10; Hebrews 10: 4-10; and Luke 1: 26-38. Pray that the church – with our many denominations – might set an example to the world by demonstrating unity in diversity.